URparamount - Portable Water Ionizer Hydrogen Stick for alkaline ionized water! Deeper discounts start with purchase of only TWO! The Portable Water Ionizer Hydrogen Stick changes any tap or bottled water into high pH, antioxidant, micro-clustered, oxygenated alkaline drinking water, rich in hydrogen. It is well-known that disease (and cancer) cannot live in an alkaline, oxygenated environment, as demonstrated by Dr. Otto Warburg in 1931 who won the Nobel Prize for his work. You get this and more - the ionic stick also filters chlorine, heavy metals and many other impurities, so it's a filter AND an ionizer. In as little as 30 minutes you can raise the pH and lower the ORP (millivoltage) of your drinking water, plus, you can use the water ionizer stick over and over again! Each stick is good for 510 sixteen-ounce bottles or 255 quart bottles! 1 Stick $19.95, 2-3 $17.95, 4-8 $16.50, 9-20 and the price drops to $15.00! $735 plus FREE GIFTS (includes TWO sticks)! Click here to learn how to clean water ionizer sticks for extended use! I have tested this portable ionizer stick using a standard pH testing reagent, a digital pH meter and an ORP meter (measures the millivoltage of the water which is the antioxidant property). I use these when I'm out and about, and you can be sure I wouldn't if the tests didn't prove they're great! I also tested several other sticks that look the same, some that look different and some that are half the size, but these are the ones I chose to import, sell and use. FYI - the longer the ionizer sticks are left in the water, the stronger the ionization (higher pH and lower negative charge - ORP). These Portable Water Ionizer HYDROGEN Sticks provide LIFE-GIVING Hydrogen! The hydrogen produces an abundance of Oxygen for more energy, more life, more health! Hydrogen comprises 10% of our body weight, but taking into account the fact that the atom of hydrogen is the smallest and lightest among all the chemical elements, its quantity in our body absolutely surpasses the quantity of all other elements! We are a hydrogen body like the Sun. The synthesis of other elements takes place on the Sun and the same synthesis takes place inside us but the process does not generate the heat. Stars, like the Sun, die because of a hydrogen deficiency - and a man does too. Enjoy your new Hydrogen Water Ionizer stick and may you go from strength to strength! Also known as the diet water stick or diet ion stick! This stick changes water into high pH antioxidant micro-clustered alkaline water! Great for everyday use and/or traveling! Good for your pets too! clarity and, most important... scavenge up damaging free radicals! HOW I IONIZED ACIDIC WATER pH 5 up to 10 while traveling!! The magnesium in these hydrogen ionizer sticks generates hydrogen and suppresses the increase of radical oxygen molecules that are said to be detrimental to your body. By suppressing radical oxygen, ionized water with an abundance of hydrogen prevents oxidation of the body, prevents aging, and is otherwise known as an anti-oxidant. Active oxygen is believed to deactivate enzymes in the cells, damage DNA and destroy lipid membranes, which might cause every possible disease. Hydrogen suppresses this process. Hydrogen, which pools in 6 major organs according to 1937 Nobel laureate Dr. Albert Szent-Gyorgi, plays a singular role in detoxification and thereby further reduces the risk of disease and decay. "Hydrogen is really the only energy the body recognizes and is the necessary ingredient for ATP production" said Szent-Gyorgi in his 1937 Nobel address. He went on to describe the body's natural process of digesting carbohydrates to provide hydrogen in the making of ATP or energy for the body. Today, these hydrogen sticks are sold in major super markets and drug stores all over Japan. 2 sticks for a quart (or 1 liter) bottle." Learn how to super-extend the useful life of water ionizer sticks! At 30 minutes the pH was 9.27 and the ORP was lowered from a starting point of +225 to +45. At 2 hours the pH was 9.54 and the ORP -136. After 4 hours the pH was 9.79 and the ORP -287. The pH and ORP continue to improve if left overnight. 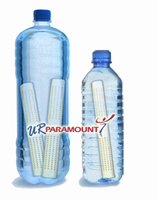 Our sales literature states "Raises pH to 8.5+" because the manufacturer's testing was certified at this level by the Hokkaido Pharmaceutical Association Public Health Examination Centre of Japan, as they tested this stick for a short period of time only to show that the water had a high enough pH to be drinkable and healthy. Remember, the results are always dependent on the composition of the source water. 1. Before using, put the stick in a clean bottle filled half-way with water. Shake vigorously for 10 seconds and dispose. Repeat. This removes excess minerals. 2. Fill the bottle with tap water or place the ionic stick in a purchased bottle of water, preferably one with a 7pH or higher. 3. Shake the bottle about 10 times and wait 30 minutes before drinking. The longer the water sits with the ionic stick submerged, the stronger the ionization and the higher the pH, up to pH 9.8 and -300mv when left overnight. If you leave the stick submerged overnight, the water may be fine, or may taste too strong, depending on the compostition of the original source water. If it tastes too strong, dilute it a bit with additional source water. 4. Use one stick for a 16 oz bottle (500ml). Use two sticks for a quart (1 liter) bottle, or more sticks for faster, stronger ionized drinking water. Great for traveling! 5. When you open your bottle, you may hear a whoosh as some Hydrogen gas escapes, a sound similar to opening a carbonated drink. Keep your bottle closed between drinks to keep the hydrogen in, as it dissolves into the water. 6. Best to drink freshly made ionized water, and drink often! Use this ionized water for cooking and for pets! I am never concerned with the quality of bottled water when I'm traveling because I make my own! I use the water ionizer sticks and a good filter bottle (I currently like THE BOBBLE BOTTLE). After I pass through airport security and have to drink or dump my water, I find the nearest water fountain. I fill up the filter bottle and slowly squeeze the water into my 1 liter drinking bottle that has 2 sticks inside. I refill the filter bottle when it gets to about half full to make it easier to squeeze. Then I put the filter bottle away, shake my liter bottle with the sticks in it a few times, and after about 1/2 hour I'm ready to drink again! I follow this same procedure when on the road, or in a hotel or even at a trade show - basically anytime I'm away from my water ionizer. Now you can use these sticks in place of a water ionizer, but a water ionizer attached to your kitchen faucet filters and ionizes water instantly and to a stronger degree. Over time the water ionizer is less expensive since they have a minimum life span of 10 years. Check out the water ionizers we offer, and call with questions! Good for 2-3 months with daily use. 255 quarts (240 liters) or 510 16oz. bottles (480 500ml bottles). No longer active when chlorine taste and/or smell is present. You may also test the pH with the pH Testing Kit. It quickly decomposes and removes chlorine and other unpleasant odors of chlorinated water. Quickly absorbs and decomposes chlorine, heavy metals and other impurities! Simple! Once a week, let the stick sit submerged in a glass or bottle adding either 1/4 cup of white vinegar OR 1/2 tsp of citric acid. Let sit for about 1/2 hour (more is ok, so don't worry). This cleans excess mineral deposits from minerals inside the stick, prolonging their life. Rinse thoroughly in good, clean water, and you're back in business again! Click here to purchase Citric Acid sold primarily for deep cleaning water ionizers. It improves metabolism by cleaning and activating body cells! Ionized alkaline water consists of small molecule clusters, which facilitate the decomposition of body fat. This water is silky smooth and easy to drink so you can drink large amounts. It is also effective for rejuvenation of blood, body detoxification, overall health promotion, prevention of hyperacidity and abnormal gastrointestinal fermentation and constipation.